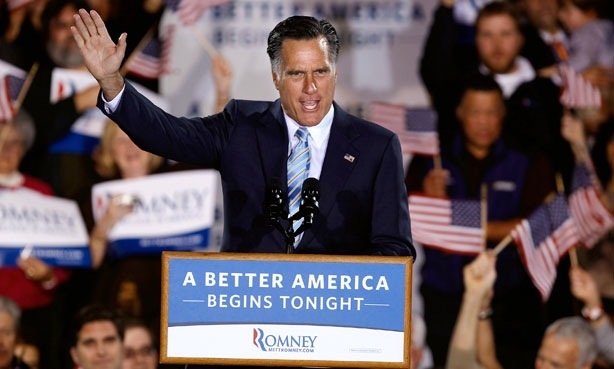 Photo Source: “It was also shamelessly maudlin, mendacious in the extreme, and otherwise completely of a piece with the entire campaign that has been waged by the man who delivered it in triumph last night”, Charles P. Pierce, Game Over: Mitt Romney’s Big Night, Esquire magazine, April 25, 2012. He’s getting better at being shameless. Believe that. In retrospect, it’s hard to believe anyone ever took seriously the notion that Romney was not inevitable. With Obamacare fully installed, government will come to control half the economy, and we will have effectively ceased to be a free-enterprise society. This president is putting us on a path where our lives will be ruled by bureaucrats and boards, commissions and czars. He’s asking us to accept that Washington knows best — and can provide all. That passage is pure Nixon, when it is not pure Glenn Beck. (We’re back to “czars” again?) Massachusetts did not “cease to be a free-enterprise society” when he passed his health-care plan there. (He can look at my insurance bill if he’s still unclear about that.) But because he has rolled so powerfully to the nomination, he can say pretty much anything at this point because the power of his campaign now far outweighs the truth of his words. There once again is a rising sense of inevitability about him, and he is most comfortable with that. There is nothing light or casual about what he’s doing. He sees a property worth buying, and he’s in it for the kill.